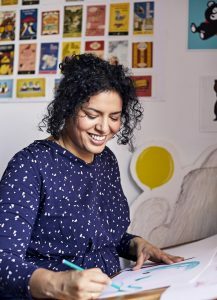 Most authors rely on someone else to illustrate their books, but Nadia is one of those annoyingly talented people who can do both! I write and illustrate picture books. My readers are typically between 3-6 years old, though babies also enjoy chewing them. I spend a lot of time at my desk drawing animals, which is good fun! I also visit schools to do story sessions, and also perform at literature festivals. I sometimes write articles or blog posts, too. I had been working as a magazine journalist since my early 20s, but aft er about ten years I felt I wasn’t very good or interested in that world any more. So I started doing part-time courses in illustration while I tried to ﬁgure out what to do. At the end of one course, I displayed a picture book I’d made called Good Little Wolf. Some publishers really liked it and oﬀered me a book deal the next day. I couldn’t believe it! Almost everything. I feel so lucky. I love drawing and making up stories, and I love books and writing. I’m deﬁnitely a tired and grumpy grown-up, but I ﬁnd it easy to remember what it felt like to be little. I naturally feel on the side of the small person looking up at the big people. I also love going into schools and meeting children who get so excited about stories. It can be quite lonely. I work from home and go for hours without talking. I also can’t pick and choose which bits of the job to do – I have to do all of it, even the boring bits like drawing leaves. You need to be good at drawing, though everyone draws in a diﬀerent way and who’s to say what’s ‘good’ and what isn’t? It’s important to understand what people want from a picture book: you want to keep the attention of little kids, and hopefully entertain them and even sneakily teach them stuﬀ. Teachers, parents and librarians are all very interested in picture books, so it’s good to keep them in mind, too. Go into a bookshop and start really looking at picture books… how many pages are there? How many words? How do the pictures and words work together on a page? Hopefully, the pictures and words both tell you diﬀerent things, so that when you put them together in your mind, you get the full story. Then have a go at making your own! I make loads of ‘dummy’ books just using pencils and printer paper. I ﬁddle around with words and the order of pictures, then tweak and reﬁne things until I have a story that ﬂows. Lots of people in the publishing world are worried about the impact of the internet and computers, but I honestly think that as long as kids like snuggling up to their mums and dads at bedtime, we will have picture books. 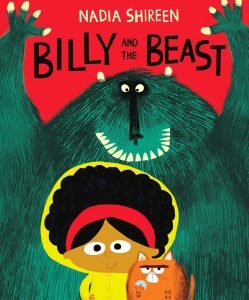 Nadia’s latest book, Billy And The Beast, is out now.